​My years of art study were done at the San Francisco Art Institute, focusing on printmaking and ceramics. When creating my sculptural pieces, i have chosen imaginative characters with which to show the lighter side of life. Working with clay allows my to squeeze and twist the pieces just so; to capture feelings and expressions that I hope will bring a bit of tickled enjoyment to those viewing my work. Recently, I have become intrigued with integrating mixed media into my work. Slices of old black and white photos, wire and beads adorn the figures and vessels I make. 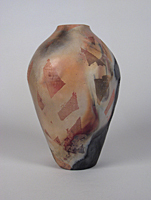 Elegant form and brilliant glazes are the hallmarks of Ross Spangler's work. Reminiscent of the refined styles of ancient Chinese and Japanese pottery, Ross' pieces reflect a timeless balance of graceful form, delicate glaze techniques and meticulous craftsmanship of porcelain. All pieces are completely lead free. I like my work to tell you that it was made by hand - the shaping, texturing, and glazing - and as you can see, not even two parts to a pair are exactly alike. The basic material is clay plus ideas suggested by nature. After a formal education in fine art and sculpture, I turned to clay. I'm now constantly challenged to make a functional piece that brings beauty and aesthetic into people's daily lives. I'm attracted to the strong clean white quality of porcelain, but also to the wonderful raw, warm earthiness of sculpture clay. I guess working in both media somehow keeps me balanced. I consider myself a painter/potter because I choose to paint images on clay rather than canvas. I enjoy the decorative process of combining form, function and decoration. Whether its a complicated repeat pattern or an abstract overall design, form and usability are very important and an integral part of the finished piece. I make one-of-a-kind thrown porcelain pieces using crystalline glazes and other similar high-fire fluid glazes, some matt and some high gloss. These kinds of glazes require an exacting application of glaze and firing schedule to be successful. I experiment with new glazes and applications in every work cycle, which are fired in a large commercially manufactured electric kiln with a modern electronic controller which I rebuilt to fire these kinds of glazes. I gravitate to and select glazes that reflect to me some property of nature, whether the cosmos or lichens growing on a rock. My studio is in the Southern Sierra on a tract of private land in what is now Sequoia National Monument. The ‘style’ of my work is directed by the clay. When I use a fine white porcelain my work becomes very painterly, but porcelain is extremely temperamental: sticky, prone to cracking, slumping when thin; though the thinness and translucence keep me coming back. Coarse sculpture clays lead me in a more gestural, visceral direction: they are very plastic, forgiving, and the work holds together like iron, but the surface itself is often unbeautiful. A white stoneware is in between, without the best features or pitfalls of either. Looking for grace and humor, I use them all! I am inspired by using a variety of media to express statements about the rhythms and cycles of living. The creative nature of the universe excites me and I filter this through my lens of female experience. I started making pine needle baskets in 1996, a direct result of living under some messy long needled pine trees. I enjoy the meditative aspect of making a coiled vessel, connecting to the greater rhythms, cycles and circles of life. In 2011, I added ceramic to my mix of media, exploring sculptural forms, mosaic, and primitive pit fired clay. 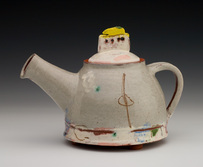 Jane Woodside is an independent ceramic artist working in Fairfax, California. She works primarily in red and black stoneware clays because she loves the unusual effects they have on glazes. 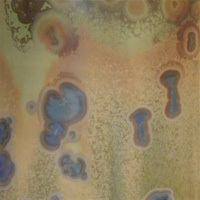 She decorates each piece with wax resist and several layers of glaze to achieve a unique textural surface. Her work is inspired by the Arts and Crafts movement, the ceramic arts of Morocco, various textile arts and the geometry of the natural world. Itsuko Zenitani, from Kyoto, Japan relocated to the US in 1980 and began her work at the Potters' Studio in Berkeley, CA. Itsuko's current emphasis is on creating pieces that, while perfectly functional are still pleasing to the eye. Her delicately thrown porcelain forms are quite thin but very strong and feel right in the hand. 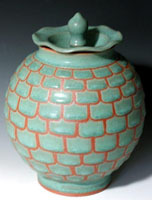 Further depth is added through subtle patterns of a traditional Celadon or Tenmoku glaze.